The “Year of the Rooster” gets a wake-up call from DreamWorks Animation’s Kung Fu Panda stars, Po and Tigress when they make their first-ever appearance during Universal Studios Hollywood’s annual Lunar New Year. The event is included in the price of theme park admission and will take place from Jan. 21 to Feb. 5,. A highlight of the time-honored tradition will mark the return of the Mandarin-speaking MEGATRON who will engage guests in conversation characteristic of his persona as the leader of the DECEPTICON. Also joining the festivities will be theme park characters, Curious George and Woody Woodpecker, who will don festive Chinese attire. Lunar New Year comes to life within Universal Plaza, situated at the heart of the theme park where guests will be ushered into the polygon-shaped piazza, under a curtain of customary red Chinese lanterns and a stunning plum blossom arch. Inside they will encounter a dozen lampposts, each featuring banners of the twelve zodiac animal signs along with three symbolic attributes. Expertly-trained Mandarin-speaking tour guides provide insight into the world of movie-making magic as guests enjoy a front row seat and behind-the-scenes access to one of the largest production studios in the world. In-language park maps are also available for guests. As part of the celebratory Lunar New Year event, guests are also invited to toast the “Year of the Rooster” at Universal CityWalk’s newest restaurant, Dongpo Kitchen, serving upscale and modern Sichuan cuisine. Inspired by China’s premiere restaurant Meizhou Dongpo and its renowned and innovative owners, Chef Mr. Wang and his wife Mrs. Liang, Dongpo Kitchen, features the comforts of a casual dining environment with both indoor and al fresco seating and caters to an eclectic palate with a variety of signature dishes ranging from Dongpo fried noodles, roasted duck salad, spicy chicken to specialty beverage shakes such as dragon well green tea and roasted oolong milk tea. Mandarin-speaking guests can learn more about the Lunar New Year event at ush.cn. Information is also available on Facebook, Instagram, Twitter, YouTube and Weibo @好莱坞环球影城. For California residents, Universal Studios Hollywood’s recently introduced California Neighbor Pass is chock full of benefits, enabling guests to choose any day for their first visit and return to enjoy Universal Studios Hollywood for select days and weekends. 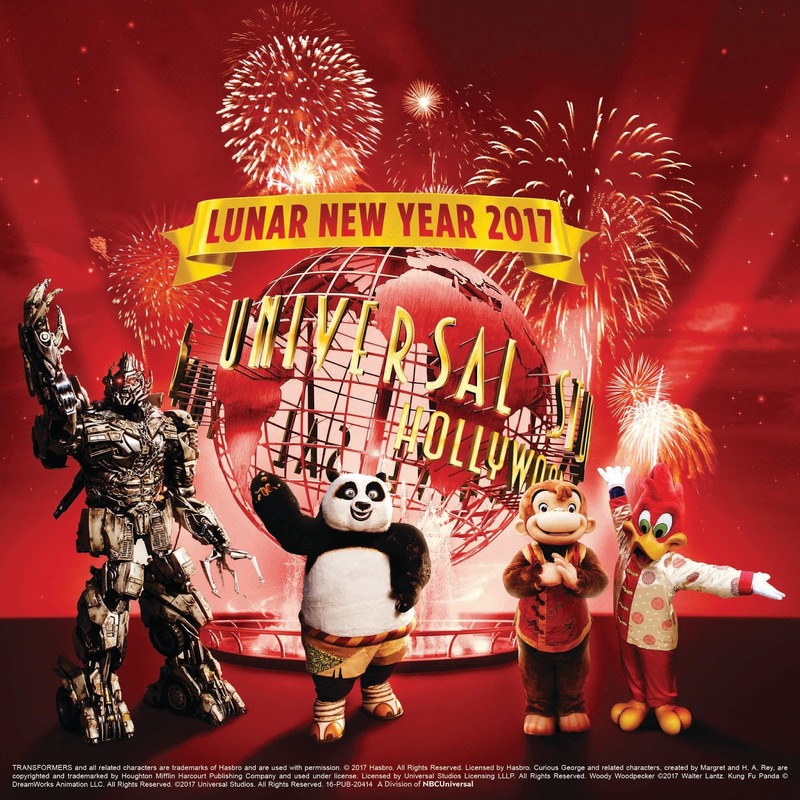 Discounts on general admission tickets for friends and family to the theme park also include access to special events, such as Lunar New Year. Universal Studios Hollywood is The Entertainment Capital of L.A. and includes a full-day, movie-based theme park and Studio Tour. As a leading global entertainment destination, Universal Studios Hollywood delivers highly themed immersive lands that translate to real-life interpretations of iconic movie and television shows. Recent additions include “The Wizarding World of Harry Potter ™” which features a bustling Hogsmeade village and such critically-acclaimed rides as “Harry Potter and the Forbidden Journey” and “Flight of the Hippogriff™,”Universal Studios Hollywood’s first outdoor rollercoaster. Other immersive lands include “Despicable Me Minion Mayhem” and “Super Silly Fun Land” as well as “Springfield,” hometown of America’s favorite TV family, located adjacent to the award-winning “The Simpsons RideTM.” and the all-new “The Walking Dead” daytime attraction. The world-renowned Studio Tour is Universal Studios Hollywood’s signature attraction, inviting guests behind-the-scenes of the world’s biggest and busiest movie and television studio where they can also experience such authentic and immersive thrill rides as “Fast & Furious—Supercharged.” The destination also features the Universal CityWalk entertainment, shopping and dining complex, including the Universal CityWalk Cinemas and the “5 Towers” state-of-the-art outdoor concert venue.